Scrape sides of bowl again, mix again until blended. 1. Add Dry Stuff to Wet Stuff and fold in with spatula several times before turning mixer back on, otherwise you'll have a gigantic cloud of flour, oops! Blend until it looks very wet and thoroughly mixed. Lovely Note: Gluten free flour (especially buckwheat) is unique, not too difficult, just different. I find that the dough has a different consistency than regular, gluteny flour and will almost look as though it won't hold together and is too wet. Don't worry, this is normal! The trick is to let it rest. Flour takes a bit of time to absorb moisture, so you don't want to rush and add more flour. You should be able to pinch some dough between your fingers and roll it into a small sticky ball, if you can do this, your dough is perfect (see photo). If it still sticks to you, well you might need to add more flour, but make sure you do 3 test cookies, bake and cool them before adding more flour. Now back to the tasty recipe. 3. Let dough rest for 10 minutes (that's right campers, 10 whole minutes of not touching or eating your cookie dough... ok sneak a small bit, you need to taste test, right?!). While your dough is resting prep your sugar, Sugah. I use a small bowl (usually with a lid so I can reuse it later) and cover the bottom with sugar, eh, about a 1/3 cup to start. I then sprinkle ground ginger into the bowl (mmm ginger! ), until it's a wonderful blond color (this amount changes upon my mood and taste buds). 4. After snapping the lid on and blending well, I start prepping my stone ware for baking and my parchment for cooling. I rotate 2 stones for a 1/2 batch of cookies, 3 when I am doing a full batch. Clear a spot on your counter and lay out a couple sheets of parchment paper for cooling your cookies - really after cooling them this way you won't go back to wire cookie racks. 5. And... Time! It's been 10 minutes and you can start balling the cookie dough. I like my cookies on the smaller side (makes me feel better about eating 10 of them, because hey that's really only like 5, right?? ), I usually make them about 1/2-3/4". I roll about 5 balls, dust in the sugar/ginger mix, pull aside and set on a plate (not on the stone quite yet), then 5 more, until I have about 15 balls. Wonderful Tip: I have found I get the best crinkly results when I place the cookies quickly, all at once, on the stone, rather than roll, dust, squeeze, place, roll, dust, squeeze, place... This is because they start to cook when you place them on the warm stone and the crinkle melts right out of them while waiting for the rest of the gang to be placed on the stone. 7. Give the cookies about 1" breathing room between their mates. Pop into preheated oven and bake for 9-11 minutes based upon desired snappiness. 8. While that's baking, roll, dust, plate more cookie balls. 9. Beep! Once you pull the cookies out of the oven don't let them sit on the stone for more than the 30 seconds it takes you to locate your spatula (I use a metal one on my stoneware), or else they'll keep cooking. Place on the parchment and try to not eat them until they're cooled (but we both know you're going to sneak a couple... in the name of testing!). I prefer parchment because it gives my cookies a clean, professional-like bottom. 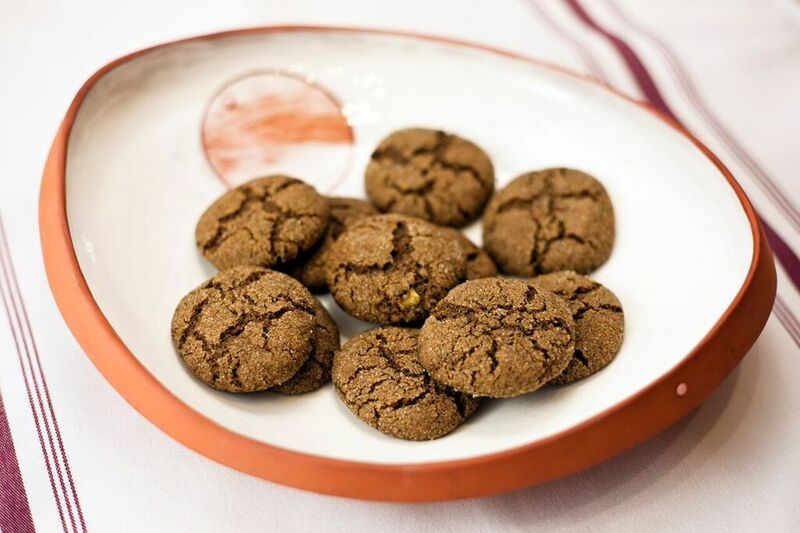 Since the cookies are still soft and impressionable, they'll pick up little checkered marks from cookie cooling racks, and will stick through the wires; tearing your cookies as your lift them off (and really... who likes cleaning cookie cooling racks?!). 10. Let cool completely (no joke) before placing in a container. They must completely reach room temperature before you can think about storing them, otherwise the warm moisture in the cookie will cause them to become soggy if sealed in a bag. 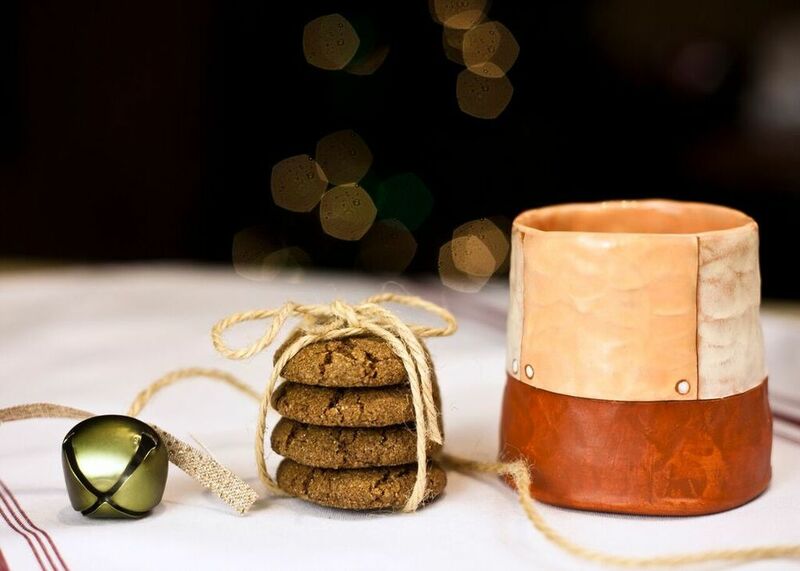 I like serving ginger snap cookies for holidays along side spiced tea, as birthday presents, and as a little pick me up. They also freeze well.